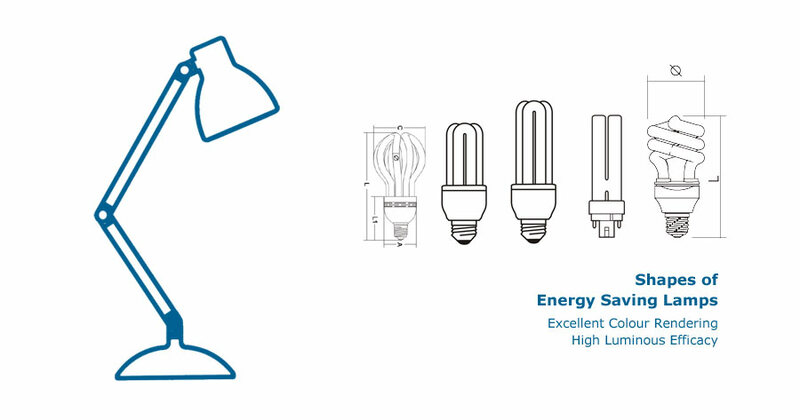 The energy saving lamps are commonly known for their spiral design, but they're also built into other lamp shapes like twin-tube, triple-tube, and quad tube CFLs, circline CFLs, PAR38 CFLs, and more. Consist of a high performance electronic ballast and a 2U shaped trichromatic fluorescent lamp. The whole unit is compact and simple in construction and highly effective in light emitting, with soft light, excellent chromaticness and low heat-emission. Moreover, it can be instantly started even at a comparatively low temperature or voltage. Consist of a high performance electronic ballast and a 3U shaped trichromatic fluorescent lamp. Consist of a high performance electronic ballast and a 4U shaped trichromatic fluorescent lamp. Provides performance like incandescent bulb with less energy consumption. Amalgam technology for stable lumen output over broad temperature range. With unique spiral shaped trichromatic fluorescent tube, which uses design space optimally, results in a shorter overall length than other compact fluorescent lamps.The helical geometry minimizes light trapping, providing a more optically efficient lamp. Equipped with a diffusely scattering glass spherical l cover. Stainless Steel Base makes sure longer life time. Equipped with a diffusely scattering glass cylindrical cover giving off soft and uniform light. The room can be made more inviting, comfortable and functional when you choose the styles of the lamp. Equipped with a diffusely scattering glass candle cover. It looks more attractive and is suitable for all living rooms, especially where decoration lighting is needed. The performance is same with the standard energy saving lamp. Consist of a high performance electronic ballast and a circle shaped trichromatic fluorescent tube. The quality electronic ballast combines high light output with long life to offer dramatic energy savings. Provides performance as same as standard energy saving lamp, which just equipped with a diffusely scattering glass bulb cover (it's shape looks like a incandescent bulb). The bulb series can give off soft and uniform light, also can make a more comfortable lighting space. Have all the benefits of energy saving lamp in . Makes the lamp tube to be separated from the socket base. Once the lamp tube is found in failure, replacement is quick and easy by any lamp tubes as indicated at the packing. This makes the best in the environmental and economic considerations without total disposal of the lamp. Also, the lamp tubes can be available from many countries.